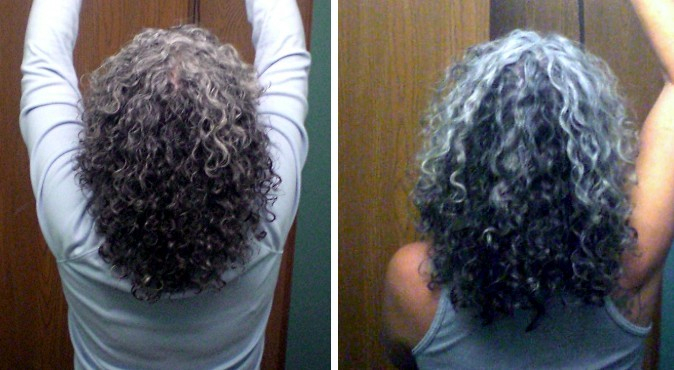 Jeepy's CG and grey hair progress. Updated 9-2018! 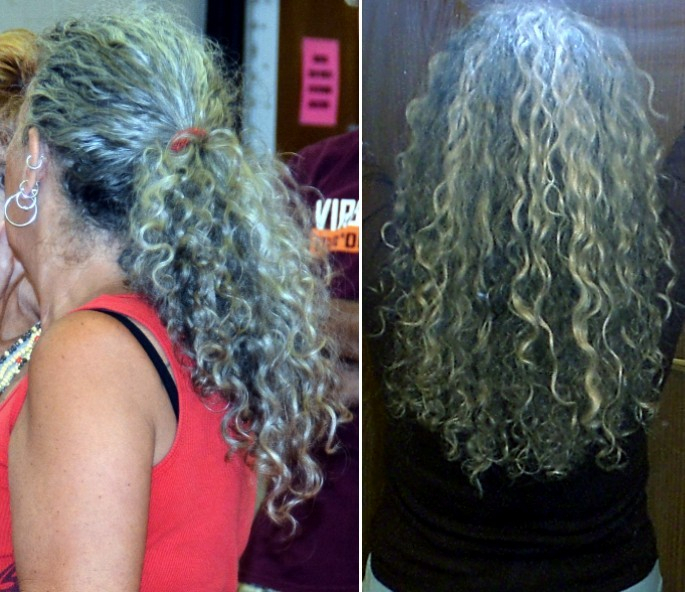 I kept my hair pics on a free online site for many years so they could be shared here with my NC folks but they no longer offer it for free. So I thought I would just make a thread here, which makes it easy to share with you all and easy for me to keep track of my own progress. Here it is 2005-2006, when I first gave up shampoo and also started going grey. wow! amazing from year to year. i love all, they all look so good and so healthy. I agree with rbb, your hair is amazing. Since you cut it yourself, how do you get good long layers? I want to continue to cut my own but I'm having trouble figuring out how to cut the back layers like the sides. I still cut my hair 1 of 2 ways. If I'm being lazy and just want a bit of a trim I put my hair on top of my head in a high pony tail. Then I hold the ends all together and just snip right across. I will do it this way with my hair wet or dry. If I'm not being lazy and want all over layers I leave my hair down and trim each clump (per the Curly Girl method). I do this with my hair dry, but freshly washed so the curls aren't stretched out or messed up from sleeping or wearing in a pony. I love seeing happy hair! Agree with BeinDeb - you are an inspiration! I wish my hair was still thick enough to be able to have it long like yours, it's lovely. It also gives me hope that my hair won't always be the hot mess of colours it is now! I have never taken a photo of my hair. Thanks everyone! My hair actually used to be MUCH thicker. I had 2 big sheds in the last few years (stress, hormones, age) when handfuls of hair fell out every day. It was very scary but it seemed to settle down and luckily curly hair is a great hider of thinning hair. I  your hair so much! Thanks for the hair journey! My curl is very similar to yours. I'm still dying the gray but seeing your pics give me hope that long gray hair can be beautiful! I took a photo once when I thought I was having a good hair day. It looked awful so I deleted it and have never bothered again! Your hair is so gorgeous. If I saw someone with your hair and color in real life, I'd run across the room to tell them how amazing it is. Thank you so much for sharing your journey! Subscribed the thread for your new update! OMG, Jeepy, did you cut your hair?? it looks freaking amazing! how is it cut, and are you using the same styling aids? whats your technique?? How is it cut? Myrna, I haven't cut it other than some trims and shaping so it pretty much still looks like the pics that are dated 2015/2016. I am still using LA Looks Sport Gel. And my cutting techniques are explained in post #9. And thanks! I love your hair...grey and all! I've been dreading letting my grey grow out, but yours is absolutely stunning! Question though...was there any point along the way (beginning, middle, current) that you hated how the grey looked?? Did you just quit dying it and kept it long or ? I just don't want to go from medium brown to super grey!!! And definitely want to keep my length (like yours, maybe even longer). 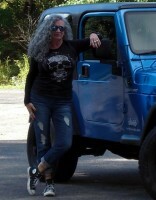 Debra Ann, I am not speaking for Jeepy. 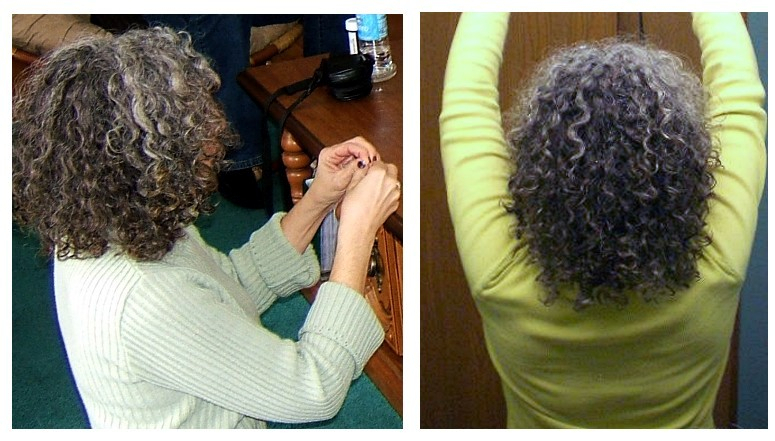 But there are support groups on FB for women who are going gray such as Going Georgeously Gray and Going Gray and Loving It; there is also a Curly Silvers group. For many of us, its a "journey". I was coloring my roots every three weeks when I decided it was time to stop. 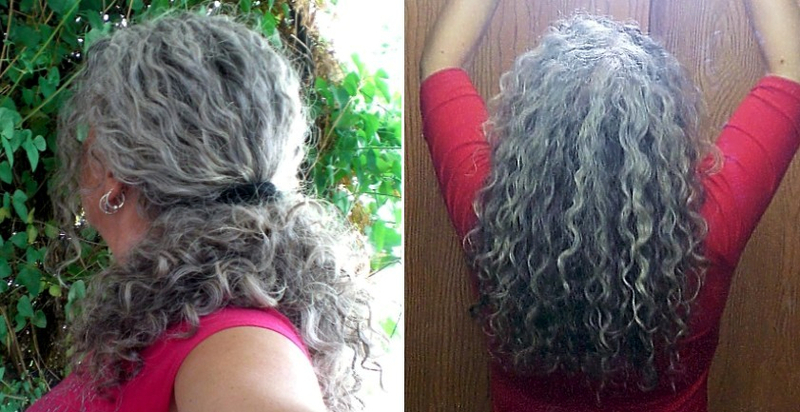 I think it is somewhat easier for curlies, as we do not exactly get a "stripe". I think many curlies have our most difficult times between 3-6 months.I think I grew my silver for about a year, then I had it cut into an angled bob, which got rid of all the brown. Now I have decided to add some more length. I never hated my transition - I had people tell me they loved my ombre hair and how did I get that? Lol. Well, as I said I am not speaking for Jeepy, just wanted to throw some support your way. I never dyed my hair so when it started to go grey I just let it go. Yes, there were many times I'm missed my dark hair (I think the transition would have been super easy if I was a blonde. I love grey hair so the color wasn't the issue, it was just going from dark to light that I didn't like so much). But I knew I didn't want to spend time and money dying it and I didn't want to damage my hair. I cut my hair to a chin length bob (which is my 2nd favorite hair length next to long) and kept trimming it as the grey grew in then I let it go back to being long. My hair and I are both very happy being natural. Thank you for answering my question. I, too, dye my hair every three weeks. I don't mind doing it (well, hubby doesn't, lol) but know that eventually I will have to (I think?) I just hate the fact that I will have to cut it off after a while. It is down to my waist right now (in its curly state) and I don't want to cut it any shorter, and definitely not "bob" style or even to my shoulders. It took me forever to get this length. Beside the fact that I cut my hair short ten years ago and absolutely HATED it on me! (of course everyone else "said" they loved it, lol. I look older with my hair cut. I know they say when you get to a certain age you look better with short hair, but I disagree. Hey, Debra Ann, you will definitely find other long haired silver foxes in these groups! when you join, you can post about that. You will have a longer journey, but honestly, once your silver reaches about to your shoulders, it has a two toned "ombre" beauty all its own. You dont have to cut it; I wore mine up in a bun for a while and I really loved that look. There are many things you can to with it while it is turning silver. See you there! LOL just joined all of them (or requested to join?) Will see you there! Thanks Myrna! 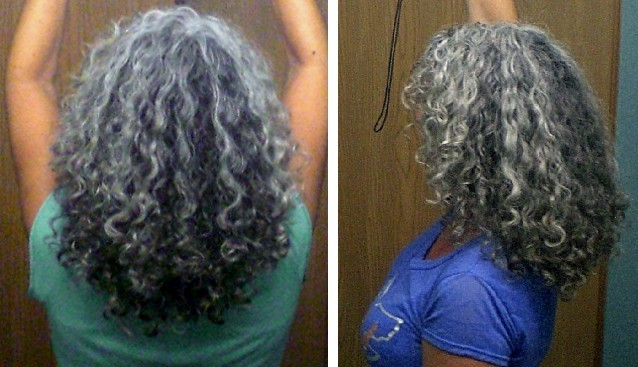 Grey hair doesn't make anyone look older. It's just the media telling us so. Grey is just another color. And there's no need to cut your hair. (Again, don't listen to what the magazines say we should or shouldn't do). It's just an option to get rid of the old color faster. Just keep trimming your hair as it grows out just as you normally would and eventually the old color will be gone!